Students have sat in mathematics classrooms year after year often feeling what they are experiencing has little meaning and is not worth their time. Students enter a high school math classroom with a strong set of perceptions and attitudes about mathematics. This set of perceptions and attitudes often hinders students’ ability to learn. We are now living in a time where standards and assessment are driving the educational discussion in our country, but can they encourage a positive change in the way students think about mathematics? If we want students to change the way they think about mathematics, we have to change the way they experience mathematics. Students need to feel what they are experiencing in the mathematics classroom is both interesting and enjoyable. Students need to feel that mathematics makes sense. Students need to feel that mathematics is meaningful for their lives. The Standards of Mathematical Practice are valuable ideas based on the NCTM Process Standards and the NRC Five Strands of Mathematical Proficiency. They give life to what students need to experience in the classroom. They talk of a classroom where students persevere with problems, reason through complex situations, argue about mathematical ideas, model real world situations, and look at math as a coherent discipline where ideas are connected and patterns are seen as an underlying structure of mathematics. In inquiry-based instruction, mathematics is viewed as a humanistic discipline where students construct meaning and understanding within a community of learners (Borasi, 1992). It is a multifaceted approach to learning. Students are encouraged to wonder about mathematical ideas, raise questions, make observations, gather data, consider possible relationships and patterns within the data, make conjectures, test one’s conjectures, and finally generalize a discovery supported by evidence (Borasi, 1992; NRC, 1996; Suchman, 1968; Wells, 1999). Generating an idea or concept and arguing for its authenticity is an essential aspect of inquiry and tells a teacher what a student knows about mathematics (Koehler & Grouws, 1992; Lampert, 1990). Asking students to think mathematically is essential to the mathematics classroom. In inquiry instruction, students are asked to think when they grapple with open-ended tasks independently or in collaboration with other students. In developing an understanding of concepts, procedures, rules, and formulas, students are often asked to think about patterns, make conjectures and generalizations, and attempt to prove or disprove them. The thinking can be visual, algebraic, or logical. In all cases, students use their reasoning skills to develop understanding. I am forced to think [in math] too, but I already know what I am going to get so I don’t have to think as much. In English you have to come up with your own ideas. Before, they used to tell you what you have to write your essay on, and now it is just whatever is in your head. It is hard because you don’t know what is there…but with math you either got to do this or that. The teachers I had before would just teach math and they would help you write out ways instead of trying to take your time to understand it yourself. Usually they want you to do math just to solve problems…[and follow] their way of thinking of math. [My inquiry teacher] wants us to find how we think of math and how we know math… We use our own way of thinking and join [my teacher’s] ideas with our own perspective. She wants us to expand our ideas and view other perspectives, including mostly ours (Katz, 2009). tackle open-ended challenging problems and help them develop strategies and various ways of thinking and approaching the problem. construct new knowledge through investigations using interesting tasks and activities. become pattern hunters and see the importance of patterns as a means of generalizing mathematical ideas. share their conjectures, ideas, and solutions. argue about mathematics and defend their ideas with evidence and proof. ask questions and work to answer them with the teacher acting as the guide for the students. see that mathematics learning takes place inside the classroom and outside in the world. see that mathematics learning is a collaborative endeavor. Students’ perceptions of mathematics include their perceptions of the discipline and their perceptions of how they are as learners. making sense and having a coherent structure. a means of solving problems. an interesting subject worth the time and challenge to wonder about. deeply connected through big ideas. an interrelationship between concept and procedure. capable of thinking and reasoning mathematically. capable of solving different types of problems and willing to struggle and persevere. 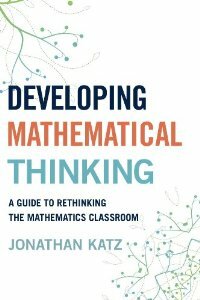 If you would like to know more about this approach to teaching and learning mathematics, see Dr. Katz’s new book: “Developing Mathematical Thinking: A Guide to Rethinking the Mathematics Classroom.” It’s available on Amazon and where fine books are sold.